It was exciting to be able to go back to the The Greater Los Angeles Master of Fine Art exhibit (GLAMFA) this week. Seeing the art for a second time was almost just as exciting. Margaret ‘Quica’ Alarcón’s exhibition, Urban Release, was especially stunning and thought provoking. I automatically wondered if the pictures were of her family, why the shadows, and whether she wanted to portray something about history. Her exhibition has many pieces that make up Urban Release, but the ones I saw were Carmella and Coyoacan. Both of these pieces were silkscreen on oil cloths. 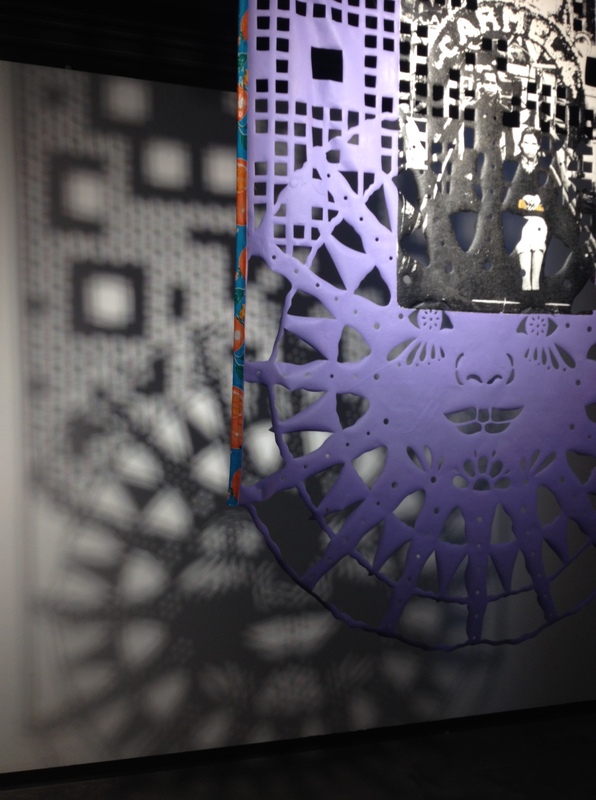 She intricately cut out shapes from the cloths, and posted pictures of her own family on the cloths.The way she hung her pieces allowed shadows to appear behind the work. The shapes and shadows were extremely fascinating to me. I watched the shadows and was drawn to the way they moved and changed as the art spun. My immediate idea was that maybe she was hoping to show that all good things have hidden darkness behind them. I thought about how not everything that looks happy is all happy. The bright colors, cheery shapes, and family photos all seem beautiful, but behind them are dark shadows, with pieces missing. The shadows show something else, they show what is behind, what is missing from the story, and the reality of life. After reading her posts I learned that my ideas were somewhat similar to her intention with the pieces. She tired to demonstrate the “evolution of feminine identity and impact of civilization”. Along with that she does express the darkness within all of us through the art. I would love to meet with her to further discuss her process of making the art and also to ask more about her inspiration. Posted in UncategorizedTagged #art110, #glamfa, #Margaret'Quica'AlarcónBookmark the permalink.